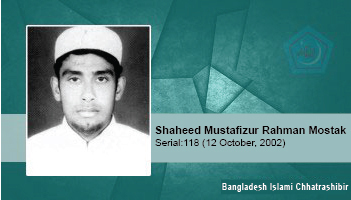 On 12 October 2002, Shaheed Mustafizur was killed in an attack by Naxalite terrorists, who had worked on the orders of failed Awami League candidate Abu Sayeed in Pabna. The Naxalites had been terrorising the area, and established a reign of terror in the constituency of Maulana Matiur Rahman Nizami. Shaheed Mustafizur had organised villagers in his area to resist the Naxalite extremists, when one night, a group of 100-150 Naxalites attacked the village after 11 pm and raided and ransacked it, severely wounding Mustafizur among others. He died from his wounds at Rajshahi Medical college hospital.